Hi All, O.K. You had to see this coming! Be honest. I've been absent for some time now and you had to know that eventually I would "put off" my commitment to Finally Finish my projects and my blog. But seriously, why should it surprise anyone? After all, I am a procrastinator, that is what I do. But I am trying and I see this only as a minor setback. I have no excuses BUT reasons; here goes. First and foremost I have retired. I have quit my job to help my daughter with child care. 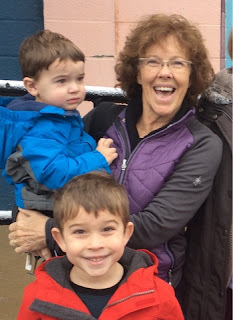 My grandsons are ages 2 and 5 years old. I love spending time with them but at the end of the day I am exhausted; too exhausted to finishing anything but the day! I know, no excuses. Back in July I fell and broke my wrist rendering me useless and unable to do ANYTHING much less finish a project and blog about it. Again, no excuses, just saying. My husband had Rotator Cuff surgery and Nurse Jackie (me) has reported for duty. It has been a long haul. If all that wasn't bad enough my elderly mother is in need of a bit more attention thus taking up more and more of my time. So lest you think I have been sitting back and eating "bon bons" you would be wrong. (OK maybe a few during the Holidays) This is water under the bridge now as far as I am concerned. I'm back ready and willing to continue my promise to finish what I've started. Which brings me to the subject of "Cat Hats", yes you read it right! 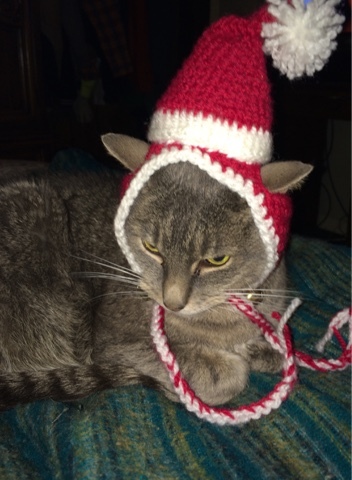 Over a year ago, my dear (but eccentric) friend told me that there is a market for "cat hats." and that "we" should look into it. Apparently some people really enjoy dressing up their felines in ridiculous costumes and are willing to fork over big bucks for them too. (You won't hear judgment from me.) That said, the next thing I know I have promised my friend a prototype Cat Hat. It took me a while but here it is and only a little over a year late. I see improvement. Somehow i don't see us making much money on this venture. It doesn't appear that George is over joyed with his new hat!